"International Boundary" redirects here. For other boundaries between nations, see border. 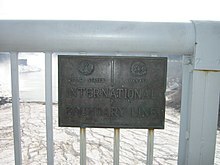 The Canada–United States border (French: frontière Canada–États-Unis), officially known as the International Boundary (French: Frontière Internationale), is the longest international border in the world between two countries. 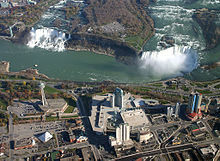 It is shared between Canada and the United States, the second- and fourth/third largest countries by area, respectively. The terrestrial boundary (including portions of maritime boundaries in the Great Lakes, and on the Atlantic, Pacific, and Arctic coasts) is 8,891 kilometres (5,525 mi) long, of which 2,475 kilometres (1,538 mi) is Canada's border with Alaska. Eight Canadian provinces and territories (Yukon, British Columbia, Alberta, Saskatchewan, Manitoba, Ontario, Quebec, and New Brunswick), and thirteen U.S. states (Alaska, Washington, Idaho, Montana, North Dakota, Minnesota, Michigan, Ohio, Pennsylvania, New York, Vermont, New Hampshire, and Maine) are located along the border. For more details, see Aroostook War, Oregon boundary dispute, and Alaska boundary dispute. The 45th parallel forms an approximate border between the Canadian province of Quebec (to the north), and the U.S. states of New York and Vermont (to the south). The Treaty of Paris of 1783 ended the American Revolutionary War between Great Britain and the United States. In the second article of the Treaty the parties agreed on all of the boundaries of the United States, including but not limited to the boundary with British North America to the north. The agreed boundary included the line from the northwest angle of Nova Scotia to the northwesternmost head of Connecticut River, and proceeded down along the middle of the river to the 45th parallel of north latitude. 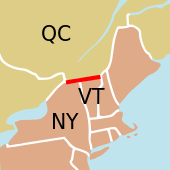 That parallel had been established in the 1760s as the boundary between the provinces of Quebec and New York (including what later became the state of Vermont). It was surveyed and marked by John Collins and Thomas Valentine from 1771 to 1773. The Saint Lawrence River and the Great Lakes became the boundary further west (between what is now Ontario and the United States). Northwest of Lake Superior, the boundary followed rivers to the Lake of the Woods. From the Lake of the Woods, the boundary was agreed to go straight west until it met the Mississippi River. In fact that line never meets the river since the river's source is further south. The Jay Treaty of 1794 (effective 1796) created the International Boundary Commission, which was charged with surveying and mapping the boundary. It also provided for removal of British military and administration from Detroit and other frontier outposts on the U.S. side. It was superseded by the Treaty of Ghent (effective 1815) concluding the War of 1812, which included pre-war boundaries. The Rush–Bagot Treaty of 1817 provided a plan for demilitarizing the two combatant sides in the War of 1812 and also laid out preliminary principles for drawing a border between British North America (later Canada) and the United States. The 49th parallel north forms a border between the Canadian provinces of British Columbia, Alberta, Saskatchewan, and Manitoba (to the north), and the U.S. states of Washington, Idaho, Montana, North Dakota, and Minnesota (to the south). Westward expansion of both British North America and the United States saw the boundary extended west along the 49th parallel from the Northwest Angle at Lake of the Woods to the Rocky Mountains under the Treaty of 1818. That treaty extinguished British claims south of that latitude to the Red River Valley, which was part of Rupert's Land. The treaty also extinguished U.S. claims to land north of that line in the watershed of the Missouri River, which was part of the Louisiana Purchase; this amounted to three small areas, consisting of the northern part of the drainages of the Milk River (today in southern Alberta and southwestern Saskatchewan), the Poplar River (Saskatchewan), and Big Muddy Creek (Saskatchewan). Along the 49th parallel, the border vista is theoretically straight but in practice follows the 19th-century surveyed border markers and varies by several hundred feet in spots. Disputes over the interpretation of the border treaties and mistakes in surveying required additional negotiations resulting in the Webster–Ashburton Treaty of 1842. The treaty resolved the dispute known as the Aroostook War over the boundary between Maine on the one hand, and New Brunswick and the Province of Canada on the other. The treaty redefined the border between New Hampshire, Vermont, and New York on the one hand, and the Province of Canada on the other, resolving the Indian Stream dispute and the Fort Blunder dilemma at the outlet to Lake Champlain. The part of the 45th parallel that separates Quebec from the U.S. states of Vermont and New York had first been surveyed from 1771 to 1773 after it had been declared the boundary between New York (including what later became Vermont) and Quebec, and it was surveyed again after the War of 1812. The U.S. federal government began to construct fortifications just south of the border at Rouses Point, New York, on Lake Champlain. After a significant portion of the construction was completed, measurements revealed that at that point, the actual 45th parallel was three-quarters of a mile (1.2 km) south of the surveyed line; the fort, which became known as "Fort Blunder", was in Canada. This created a dilemma for the United States that was not resolved until a provision of the treaty left the border on the meandering line as surveyed. The border along the Boundary Waters in present-day Ontario and Minnesota between Lake Superior and the Northwest Angle was also redefined. 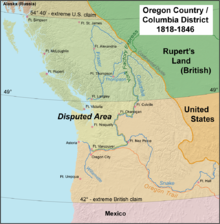 An 1844 boundary dispute during U.S. President James K. Polk's administration led to a call for the northern boundary of the U.S. west of the Rockies to be latitude 54° 40' north (related to the southern boundary of Russia's Alaska Territory), but the United Kingdom wanted a border that followed the Columbia River to the Pacific Ocean. The dispute was resolved in the Oregon Treaty of 1846, which established the 49th parallel as the boundary through the Rockies. The Northwest Boundary Survey (1857–1861) laid out the land boundary, but the water boundary was not settled for some time. After the Pig War in 1859, arbitration in 1872 established the border between the Gulf Islands and the San Juan Islands. The International Boundary Survey, called the Northern Boundary Survey in the United States, began in 1872. Its mandate was to establish the border as agreed to in the Treaty of 1818. Archibald Campbell led the way for the United States. Donald Cameron headed the British team. This survey focused on the border from the Lake of the Woods to the summit of the Rocky Mountains. In 1903 a joint United Kingdom–Canada–U.S. tribunal established the boundary of southeast Alaska. On April 11, 1908, the United Kingdom and the United States agreed, under Article IV of the Treaty of 1908, to survey and delimit the boundary between Canada and the United States through the St. Lawrence River and Great Lakes, in accordance with modern surveying techniques, and thus accomplished several changes to the border. For the bilateral commission concerning boundary waters use, see International Joint Commission. Modern International Boundary Commission boundary marker at Point Roberts, Washington. The reverse side has the same wording in French. In 1925, the International Boundary Commission (French: Commission de la frontière internationale) was made a permanent organization responsible for surveying and mapping the boundary, maintaining boundary monuments (and buoys where applicable), and keeping the boundary clear of brush and vegetation for 6 metres (20 ft). This "border vista" extends for 3 metres (9.8 ft) on each side of the line. The Commission is headed by two commissioners, one of whom is Canadian, the other American. The International Boundary is commonly referred to as the world's longest undefended border, but this is true only in the military sense, as civilian law enforcement is present. It is illegal to cross the border outside border controls. Everyone crossing the border must be checked. The relatively low level of security measures stands in contrast to that of the United States – Mexico border (one-third as long as the Canada–U.S. border), which is actively patrolled by U.S. Customs and Border Protection personnel to prevent illegal migration and drug trafficking. Parts of the International Boundary cross through mountainous terrain or heavily forested areas, but significant portions also cross remote prairie farmland and the Great Lakes and Saint Lawrence River, in addition to the maritime components of the boundary at the Atlantic, Pacific, and Arctic oceans. The border also runs through the middle of the Akwesasne Nation and even divides some buildings found in communities in Vermont and Quebec. [ Some recent editing activity in this paragraph is disputed. – discuss ] Such buildings are sometimes called line houses. The Maine–New Brunswick border divides the Aroostook Valley Country Club. 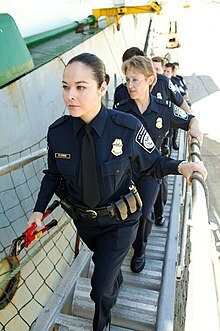 The actual number of U.S. and Canadian border security personnel is classified; there are in excess of 17,000 United States Border Patrol personnel on the Mexico–U.S. border alone. Following the September 11, 2001, terrorist attacks in the United States, security along the border was dramatically tightened by both nations in both populated and rural areas. Both nations are also actively involved in detailed and extensive tactical and strategic intelligence sharing. 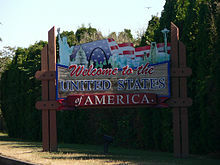 As of December 2010[update], Canada and the United States are negotiating an agreement titled "Beyond the Border: A Shared Vision for Perimeter Security and Competitiveness" which would give the U.S. more influence over Canada's border security and immigration controls, and more information would be shared by Canada with the U.S.
Detroit,Michigan can be seen from Windsor,Ontario. Residents of both nations who own property adjacent to the border are forbidden to build within the six-meter-wide (almost 20 feet) boundary vista without permission from the International Boundary Commission. They are required to report such construction to their respective governments. Where required, fences or vehicle blockades are used. All persons crossing the border are required to report to the respective customs and immigration agencies in each country. In remote areas where staffed border crossings are not available, there are hidden sensors on roads and also scattered in wooded areas near crossing points and on many trails and railways, but there are not enough border personnel on either side to verify and stop coordinated incursions. There is no border zone; the U.S. Customs and Border Protection routinely sets up checkpoints as far as 100 miles (160 km) into U.S. territory. In August 2017, the border between Quebec and New York saw an influx of up to 500 illegal crossings each day, by people seeking asylum in Canada. Canada increased border patrol and immigration staffing in the area, and reiterated that crossing the border illegally had no effect on one's asylum status. Since the beginning of January 2017 and up until the end of March 2018, the RCMP have intercepted 25,645 people crossing the border into Canada illegally. Public Safety Canada estimates another 2,500 came across in April 2018 for a total of just over 28,000. A U.S.B.P. agent tracking someone in harsh winter conditions on the northern border. Smuggling of alcoholic beverages ("rum running") was widespread during the 1920s, when Prohibition was in effect nationally in the United States and parts of Canada. In more recent years, Canadian officials have complained of drug, cigarette, and firearms smuggling from the United States, while U.S. officials have complained of drug smuggling from Canada. U.S. and Canadian agents operate separately and together along the border. From 2007 to 2010, 147 people were arrested on the property of one Blaine, Washington bed and breakfast inn, but agents estimate that they catch only about 5% of smugglers. In July 2005, law enforcement personnel arrested three men who had built a 360-foot (110 m) tunnel under the border between British Columbia and Washington that they intended to use for smuggling marijuana, the first such tunnel known on this border. Cornwall, Ontario, experiences ongoing smuggling —mostly of tobacco and firearms from the United States —because of its location. The neighboring Mohawk territory of Akwesasne straddles the Ontario–Quebec–New York borders, and its First Nations sovereignty prevents Ontario Provincial Police, Sûreté du Québec, Royal Canadian Mounted Police, Canada Border Services Agency, Canadian Coast Guard, United States Border Patrol, United States Coast Guard, and New York State Police from exercising jurisdiction over exchanges taking place within the territory. In late 2006, the United States Department of Homeland Security (DHS) announced a rule regarding new identification requirements for U.S. citizens and international travelers entering the U.S. Implemented on January 23, 2007, this final rule and first phase of the WHTI specifies six forms of identification—one of which is required in order to enter the U.S. by air: a valid passport, a United States Passport Card, a state enhanced driver's license (available in Michigan, New York, Vermont, Washington, British Columbia, Manitoba, Minnesota, Ontario, and Quebec) per the Western Hemisphere Travel Initiative, or trusted traveler program card (NEXUS, FAST, or SENTRI); a valid Merchant Mariner Credential when traveling in conjunction with official maritime business; or a valid U.S. military identification card when traveling on official orders. Since June 2009, every traveller arriving via a land or sea port-of-entry (including ferries) has been required to present one of the above forms of identification to cross the border. Length of border with the U.S. The Ambassador Bridge between Detroit, Michigan, and Windsor, Ontario, is the busiest commercial crossing between the two countries. Two portions of Niagara Falls. The American Falls is on the left in New York; the Horseshoe Falls on the right separates New York from Ontario. Twenty-six of the crossings take place at a bridge or tunnel. Ferry crossings: There are 13 international ferries operating between the U.S.and Canada. Two of them carry passengers only and one carries only rail cars. Four of the ferries operate only on a seasonal basis. Rail crossings: There are 39 railroads that cross the U.S.–Canada border. Nine of these are no longer in use. Eleven of them cross the border at bridges or tunnels. Only four international rail lines currently carry passengers between the U.S.and Canada. Unstaffed road crossings: There are six roads that do not have border inspection services in one or both directions, where travellers are legally allowed to cross the border. The U.S. maintains immigration offices, called pre-clearance facilities, in eight Canadian airports with international air service to the United States (Calgary, Edmonton, Halifax, Montreal, Ottawa, Toronto-Pearson, Vancouver, and Winnipeg). This expedites travel by allowing flights originating in Canada to land at a U.S. airport without being processed as an international arrival. Canada does not maintain equivalent personnel at U.S. airports due to the sheer number of U.S. departure locations with Canada-bound flights and the limited number of flights compared to the number of U.S.-bound flights that depart major Canadian airports. Similar arrangements exist at major Canadian seaports that handle sealed direct import shipments into the U.S.
Additionally, at Vancouver's Pacific Central Station, passengers are required to pass through U.S. preclearance facilities, and to pass their baggage through an X-ray machine before being allowed to board the Seattle-bound Amtrak Cascades train, which makes no further stops before crossing the border. Preclearance facilities are not available for the popular New York City to Montreal (Adirondack) or Toronto (Maple Leaf) trains, since these lines have stops between Montreal or Toronto and the border. Instead, passengers must clear customs at a stop located at the actual border. Ferry services operate between the province of New Brunswick and the state of Maine, as well as between the province of British Columbia and the states of Washington and Alaska. There are also several ferry services in the Great Lakes operating between the province of Ontario and the states of Michigan, New York, and Ohio. The ferry between Maine and Nova Scotia ended its operations in 2009, but resumed them in 2014. The Boldt Castle on Heart Island in the St. Lawrence River has a border control point on the island, but no specific location on the Canadian side. Canadians must present identification to land on the island. The international boundary is marked as a black line on the floor of the reading room of the Haskell Library. In this picture, Canada is on the right side of the line and the United States is on the left. One curiosity on the Canada–U.S. border is the presence of six airports that straddle the borderline. The airports were built prior to the U.S. entry into World War II as a way to legally transfer U.S.-built aircraft such as the Lockheed Hudson to Canada under the provisions of the Lend-Lease Act. In the interest of maintaining neutrality, U.S. military pilots were forbidden to deliver combat aircraft to Canada. The aircraft were flown to the border, landed, and then at night towed on their wheels over the border by tractors or horses. The next day the planes were crewed by RCAF pilots and flown to other locations, typically airbases in Eastern Canada, from where they were often flown to the United Kingdom and deployed in the Battle of the Atlantic. Piney Pinecreek Border Airport is located in Manitoba and Minnesota. The northwest/southeast-oriented runway straddles the border, and there are two ramps; one in the U.S. and one in Canada. The airport is jointly owned by the Minnesota Department of Transportation and the local government of Piney, Manitoba. It is assigned U.S. identifier 48Y and Canadian identifier JX2. International Peace Garden Airport is located in Manitoba and North Dakota adjacent to the International Peace Garden. The runway is entirely within North Dakota, but a ramp extends across the border to allow aircraft to access Canadian customs. While not jointly owned, it is operated as an international facility for customs clearance as part of the International Peace Garden. Coronach/Scobey Border Station Airport is located in Saskatchewan and Montana. The east-west runway is sited exactly on the border. The airport is jointly owned by the Canadian and U.S. governments and is assigned U.S. identifier 8U3 and Canadian identifier CKK3. Coutts/Ross International Airport is located in Alberta and Montana. Like Coronach/Scobey, the east–west runway is sited exactly on the border. It is owned entirely by the Montana Aeronautics Division. It is assigned U.S. identifier 7S8 and Canadian identifier CEP4. Whetstone International Airport or Del Bonita/Whetstone International Airport is located in Alberta and Montana, and similarly has an east-west runway sited exactly on the border. It is assigned U.S. identifier H28 and Canadian identifier CEQ4. Avey Field State Airport is located in Washington and British Columbia. The privately owned airfield is mostly in the U.S., but several hundred feet of the north-south runway extend into Canada, and both Canadian and U.S. customs are available. It is assigned U.S. identifier 69S but does not have a Canadian identifier. Half of this bench is in the United States and the other half is in Canada. The Haskell Free Library and Opera House straddles the border in Derby Line, Vermont, and Stanstead, Quebec. Private homes are divided by the International Boundary line between Estcourt Station, Maine, and Pohénégamook, Quebec. Private homes between Beebe Plain, Quebec and Beebe Plain, Vermont; a seasonal home between Alburgh, Vermont, and Noyan, Quebec, at the intersection of Matthias Lane in Alburgh and Chemin au Bord de l'Eau in Noyan; and one house between Richford, Vermont, and Abercorn, Quebec, are also divided by the border. The Halfway House, a tavern also known as Taillon's International Hotel, straddles the border between Dundee, Quebec, and Fort Covington, New York. It was built in 1820, before the border was surveyed. To be a true international exclave, all potential paths of travel from the exclave to the home country must cross over only the territory of a different country or countries. Like exclaves, practical exclaves are not contiguous with the land of the home country and have land access only through another country or countries. Unlike exclaves, they are not entirely surrounded by foreign territory. Hence, they are exclaves for practical purposes, without meeting the strict definition. Akwesasne: Because of the St. Lawrence River to the north, the St. Regis River to the east, and New York State, U.S., to the south, the Quebec Western portion of the Akwesasne reserve is a practical exclave of Canada. To travel by land to elsewhere in Canada, one must drive through New York State. Campobello Island, located at the entrance to Passamaquoddy Bay, adjacent to the entrance to Cobscook Bay, and within the Bay of Fundy. The island is part of Charlotte County, New Brunswick, but is actually physically connected by the Franklin Delano Roosevelt Bridge with Lubec, Maine, the easternmost tip of the continental United States. 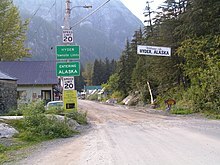 Specifically, the town of Hyder, Alaska is accessible only through Stewart, British Columbia, or by floatplane. Also Haines and Skagway are accessible by road only through Canada, although there are car ferries which connect them to other Alaskan places. Point Roberts, Washington is bounded by British Columbia, the Strait of Georgia, and Boundary Bay. Elm Point, Minnesota and two small pieces of land (Buffalo Bay Point) just to its west are bounded by Manitoba and Lake of the Woods. The Northwest Angle in Minnesota is bounded by Manitoba and Lake of the Woods. Province Point, the small end of a peninsula east of Alburgh, Vermont, is bounded by Quebec and Lake Champlain. The international border splits a peninsula within the Osthus lake in Hutchinson Township, North Dakota, and Manitoba, in the Wakopa Wildlife Management Area. Lake Metigoshe lies in North Dakota's Roland Township bordering Winchester, Manitoba, Canada. The border splits a shoreline, putting Canadian cabins on one side and the beach and boat docks for those cabins on the U.S. side. Land access is only through Canada. ^ However, this peninsula and the island to its south are connected by road bridges directly to the United States mainland (as well as by a freight [and former passenger] rail line), such that it is possible to make a through journey in and out of the Alburgh Tongue without entering Canada. This is not true of the other practical exclaves listed here. ^ Francis M. Carroll (2001). A Good and Wise Measure: The Search for the Canadian–American Boundary, 1783–1842. University of Toronto Press, Scholarly Publishing Division. p. 85. ^ "Canada & The United States (Bizarre Borders Part 2)". Retrieved June 21, 2013. ^ "British-American Diplomacy The Webster-Ashburton Treaty". Yale Law School. 1842. Retrieved March 1, 2007. ^ Lass, William E. (1980). Minnesota's Boundary with Canada. St. Paul, Minnesota: Minnesota Historical Society. p. 2. ISBN 0-87351-153-0. ^ McManus, Sheila (2005). The Line Which Separates: Race, Gender, and the Making of the Alberta-Montana Borderlands. Edmonton, Alberta: University of Alberta Press. p. 7. ISBN 0-88864-434-5. ^ Campbell, Archibald; Twining, W. J. (1878). "Reports upon the survey of the boundary between the territory of the United States and the possessions of Great Britain from the Lake of the woods to the summit of the Rocky mountains". Authorised by an act of Congress approved March 19, 1872. Government Printing Office. Retrieved September 13, 2013. ^ Keenlyside, Hugh LL. ; Brown, Gerald S. (1952). Canada and the United States: Some Aspects of Their Historical Relations. Alfred A. Knopf. pp. 178–189. ^ International Boundary Commission (1937). "Treaty of 1908 (included in Joint report upon the survey and demarcation of the boundary between the United States and Canada from the gulf of Georgia to the northwesternmost point of Lake of the woods. In accordance with the provisions of Articles VI and VII of the treaty signed at Washington April 11, 1908, and articles I, II, and IV of the treaty signed at Washington, February 24, 1925)". Washington, D.C.: U.S. Government Printing Office. p. 6. Retrieved June 18, 2015. ^ International Waterways Commission (1915). "Report of the International Waterways Commission upon the International Boundary between the Dominion of Canada and the United States through the St. Lawrence River and Great Lakes as Ascertained and Re-established pursuant to Article IV of the Treaty between Great Britain and the United States signed 11th April 1908". ^ Jeffrey, Terence P. (September 24, 2009). "Administration Will Cut Border Patrol Deployed on U.S-Mexico Border". Cybercast News Service. Archived from the original on September 28, 2009. Retrieved September 25, 2009. ^ "Common border zone proposed". Canadian Society of Customs Brokers. June 17, 2004. Retrieved May 17, 2017. ^ Singel, Ryan (October 22, 2008). "ACLU Assails 100-Mile Border Zone as 'Constitution-Free' – Update". Wired.com. Retrieved July 12, 2013. ^ Woodard, Colin (January 9, 2011). "Far From Canada, Aggressive U.S. Border Patrols Snag Foreign Students". Chronicle.com. Retrieved July 12, 2013. ^ "Number Of Asylum Seekers At Quebec Border Nearly Quadrupled In July: Officials". HuffPost Canada. August 17, 2017. Retrieved March 16, 2018. ^ Woods, Allan (August 23, 2017). "Canada is not a safe haven for asylum seekers, Trudeau warns". The Toronto Star. ISSN 0319-0781. Retrieved October 16, 2017. ^ "Trudeau says steps to tackle spike in asylum-seekers yielding 'positive results'". CBC News. Retrieved October 16, 2017. ^ MacDonald, Jake (July – August 2010). "The Canada-U.S. Border". Canadian Geographic. Archived from the original on July 10, 2010. ^ Frieden, Terry (July 22, 2006). "Drug tunnel found under Canada border: Five arrests made after agents monitored construction". CNN.com. CNN. ^ Cockburn, Neco (November 21, 2008). "Smuggling's price". Ottawa Citizen. Archived from the original on February 12, 2012. ^ "WHTI: Enhanced Drivers License". Getyouhome.gov. June 1, 2009. Archived from the original on February 15, 2012. Retrieved April 30, 2014. ^ "DHS Announces Final Western Hemisphere Air Travel". Association of Cotpotrate Travel Executives. December 5, 2006. Archived from the original on December 16, 2007. Retrieved December 2, 2007. ^ Places to Fly – Dunseith / International Peace Garden. Archive.copanational.org (June 8, 2007). Retrieved on July 12, 2013. ^ Google (April 30, 2014). "1000 Drew Rd – Richford Vermont" (Map). Google Maps. Google. Retrieved April 30, 2014. ^ "Wikimapia". Wikimapia. Retrieved April 30, 2014. ^ Robinson, G. W. S. (September 1959). "Exclaves". Annals of the Association of American Geographers. 49 (3, [Part 1]): 283–295. doi:10.1111/j.1467-8306.1959.tb01614.x. JSTOR 2561461. ^ a b c Vinokurov, Evgeny (2007). The Theory of Enclaves. Lexington Books, Lanham, MD. ^ Melamid, Alexander (1968). Sills, David (ed.). "Enclaves and Exclaves". International Encyclopedia of the Social Sciences. 5. The Macmillan Company & Free Press. Contiguous territories of states which for all regular commercial and administrative purposes can be reached only through the territory of other states are called pene-enclaves (pene-exclaves). These have virtually the same characteristics as complete enclaves (exclaves). ^ "USGS The National Map: Orthoimagery. Data refreshed October 2017". United States Geological Survey (U.S. Department of the Interior). Retrieved September 15, 2018. ^ Laychuk, Riley (July 13, 2016). "Manitoba boaters stunned by new cross-border rule". CBC News. Retrieved June 3, 2017. In fact, some of the boat docks for Canadian cabins sit on the U.S. side of the border. Anderson, Christopher G. Canadian Liberalism and the Politics of Border Control, 1867–1967 (University of British Columbia Press; 2012) 280 pages; studies pivotal episodes in Canadian immigration policy that shed light on more restrictive approaches today. Paulus, Jeremy and Asgary, Ali. 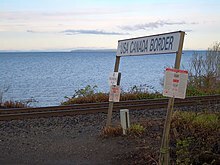 (2010) Enhancing Border Security: Local Values and Preferences at the Blue Water Bridge (Point Edward, Canada) Journal of Homeland Security and Emergency Management: Vol. 7 : Iss. 1, Article 77. 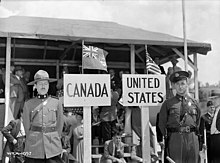 Culture and the Canada–US Border, an international research network dedicated to studying cultural representation, production and exchange on and around the Canada–US border. 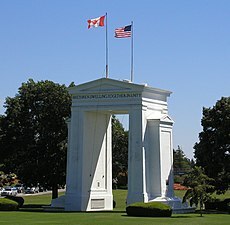 Wikimedia Commons has media related to Canada–United States border. This page was last edited on 9 April 2019, at 06:04 (UTC).